The Hazardous Material Information Resource System (HMIRS) is a U.S. Department of Defense (DoD) automated system developed and maintained by the Defense Logistics Agency. HMIRS is the central repository for Material Safety Data Sheets (MSDS) for the United States Government military services, civil agencies and their contractors. HMIRS access is restricted to U.S. government employees and government-sponsored contractors. It is not open to the general public, however a civilian version is commercially available (see below). HMIS® which is most commonly known for its familiar colored bar labeling scheme. HMIS, a U.S. Federal computerized information management system containing data to ensure the safe transportation of hazardous materials by air, highway, rail, and water. See http://www.dot.gov/pia/phmsa_hmis.htm. WHMIS, the Canadian regulations dealing with hazardous materials. Educate your workers about chemical hazards with safety posters from Safety Emporium. HMIRS gives DoD and other Federal employees access to the Material Safety Data Sheets (MSDS) for hazardous items in the government inventory. HMIRS also assists in compliance with transportation/shipping requirements through value-added data. The transportation information provides proper shipping names, hazardous classes, and shipping label requirements associated with HazMat for shipment, nationally or internationally, by any mode of transportation. Hazard warning label information is provided in the DoD Hazard Communicating Warning Label format. HMIRS information is also provided to various other DoD systems for environmental, logistics, and transportation purposes. 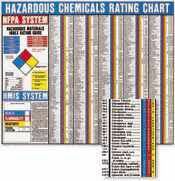 In addition, HMIRS is also the repository for the Hazard Characteristics Codes (HCC) assigned to hazardous materials. There are approximately 278,000 records in the HMIRS database. These records are now commercially available on CD-ROM and DVD-ROM through at least one private company. See the ad below for more information. The HMIRS HCC's can appear on sheets that come from the civilian version of the database or on sheets whose manufacturer has written their sheets so they can be incorporated directly into HMIRS without further changes. OSHA does not require HCC's to be on MSDS's, but, of course, the information conveyed by these codes is part of the required content. The HMIRS Home Page at the U.S. Defense Logistics Agency. HMIRS registration forms for U.S. Government employees and U.S. Government-sponsored contractors. HMIRS login page for registered users.